During my recent trip to Savannah River Site I toured the ghost town of Ellenton. Since I wrote “Atomic Paradise” last week Ellenton, an apparition, haunts me. An entire town … moved. In researching “Atomic Paradise” I examined the unexpected exodus of Ellenton’s residents and two things caught my attention. One involves nature; the other human nature. Nature first. The afternoon I saw Ellenton brushy undergrowth grew where homes had sat. Where people once slept vines hung from trees. Curbs still looked solid. Not so the cracking sidewalks, which lay beneath grass. The school’s playground looks remarkably unchanged for it has long resisted nature’s efforts to reclaim what is hers. Years of small feet running and jumping, playing ball, Red Rover Red Rover sending folks over, and tag had packed the soil into an impermeable surface. Amazing to me. Human nature next. As I probed Ellenton’s history I learned that Ellenton’s residents found out just a few days before Thanksgiving that their homes would be no more. Overnight farmers had no land. They had to find farmland right away or lose a year’s income. This shock, this sudden departure from life as usual, would extract a severe price in years to come as an excerpt reveals. Over half of those 50 and older who relocated died within ten years. That says a lot about human nature and the differences between the young and the old. The young just pick up and move. Not so the older set. When you’ve got a good many years under your belt, your heart is where home is, where you spent your life or a significant time, where you yearn to be. 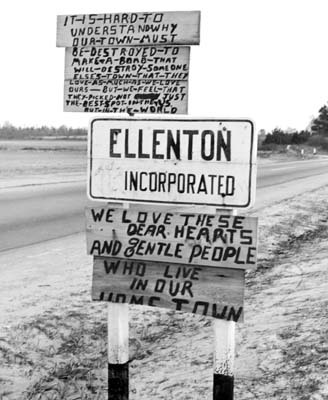 In Ellenton’s case residents’ heart remained back where they had lived. And that brings me to small towns. To me at least it seems fewer people move in and out of towns compared to cities. Lots of hustle and bustle in cities. Lots of people whose career keeps them on the move. I know a lot of people here in Columbia but few grew up here. Some, like me, became transplants but most are transients. Such people make ours a nation on the move. But! They decide when and where to move. With Ellenton’s people being picked up and replanted like a gardenia bush, I thought of my moves over the years. I’ve lived in three places: Lincolnton, Georgia; Athens, Georgia, and Columbia. My moves went like this: from high school to Athens. From Athens to Lincolnton to teach for a year. Back to Athens for a Master’s and then on to Columbia for a six-month teaching assignment. So far that six-month assignment has lasted forty years. Why? Well I don’t like moving. It’s disruptive. It’s unsettling. I don’t like starting over and over though God knows I have done that too. Let’s talk about dwellings now. In my first four years in Athens I moved four times from a dorm to apartments, and a mobile home, aka, a wobbly box. What was behind all these moves? An itch to live in a newer place and economics. Then I moved back to Lincolnton where I first rented a house and then a mobile home. And then I went back to Athens where a tornado forced a move and I lived in a series of places post-tornado. And then that temporary teaching assignment brought me to Columbia where I’ve moved eight times … rental houses, a house, a garage apartment, a big adult only apartment complex, a condominium, and finally the house I’ve owned for twenty-three years. In all, my migrations have included three places and sixteen residences. If you’ve never moved or not moved much it may leave you breathless, all my moves. Well I assure you it is nothing like people in the military endure. I’ve written before about a friend here. Her dad, a Marine fighter pilot (an ace), fought at Guadalcanal. She moved so much as a child she didn’t try to make friends. “There was no point. We moved all the time, and if we didn’t move, my friends did. Growing up, I always envied people who lived in one place.” I could hear loneliness in her voice, a lingering presence from childhood. God knows there are other things that force moves or the loss of a home: a big lake backs up and covers your home, divorce (war of another type) forces one to flee, and fires, floods, and hurricanes do their part to uproot people, and so does the loss of a loved one where memories bleed the joy out of life. I know a woman here who is selling her home because she just can’t cope with her husband’s death. “It’s been over a year and things are still depressing. I see too many reminders of happier times,” she laments. Up went the For Sale sign. Divorce evicts many from their home. Some 34 years ago I started over with nothing but a broken car, a broken heart, a dog, a sleeper sofa, and a television Dad won in a sales contest. And a few home goods of course. Led Zeppelin was right about women with no soul. Divorce is a personal way to lose a home. But the people of Ellenton endured heartache en masse. Imagine if all of you were gathered into a community center and told you have one month to find a new place to live. Perhaps you were born in the house you must now abandon. Out back are all your pets, buried with loving care. The pear tree grandpa planted out back. You’ll never taste a pear from it again. Everything must be left behind. Oh you can take your memories and that may well be the worst thing of all. You’ll keep longing for your irreplaceable home. That adage, “home is where the heart is,” rings true. Emotions don’t move. I see a lot of lessons in Ellenton. I am no fan of taking old people out of their home and putting them in an assisted living center. Used to be that just didn’t happen. What’s happened to this world? I swear the more sophisticated and “caring” we become the sorrier we get. The last place an older, frail person wants to be is some place that isn’t home. I realize that older people fall, forget to turn the oven off, don’t remember to take their medicines, and create all manner of worries but isn’t it therapeutic to keep them in the home they love? In one of the worst years of my life I almost moved to Atlanta. Had my house on the market and was looking for jobs in Atlanta. After a few months passed with no progress I came home dejected and unsure what my future would be. That’s when I found a voice message on my phone. Dad had called. “Son, take your home off the market. Columbia is your home.” He was right God bless him. No telling how much misery he saved me. It would have been a miserable, lonely transition, picking up and moving solo, starting over yet again with hair whiter than ever. They say misery loves company. The day the people packed up and left Ellenton there was misery aplenty, but nobody loved it. Within ten years families buried a good portion of the heartache created by an unexpected exodus. And the younger set? Well they scattered like a covey of quail. This rang a peel of bells: I’ve bought 13 houses in fifty years. Lived in four different countries. Obliged to move (by civil service, every five years for husband’s work), changing schools, leaving friends behind, two divorces, kids emigrating, no permanence anywhere. No base to go back to: unbelonging. So I see my roots in a flower pot to make moving easier: Mobile Home. Home is where our loved ones are and mine are global, but the links are still robust. The people in Ellenton be-longed there and my heart goes out to them. Eileen, always good to hear from you. I appreciate your thoughtful comments. Charlie I always love to hear from you and I am sorry you are going through such a hard time. I hope time makes things better. I’ll keep you in touch with my writing.